Trying to get a movement in the fabric for an upper and lower border, echoing that of the leaves, I came up with the solution below. 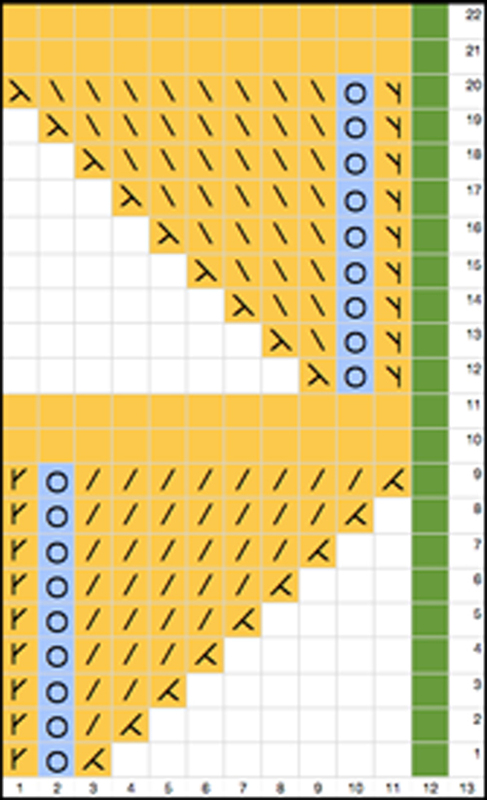 The first set of graphics represents how to fill in an empty needle, the pink again is the view as it may be on the KM, and the empty needle is filled in by picking up the purl ridge of the adjacent stitch. Working with the 12 stitch repeat used in the previous samples: the green here represents the out of work needle, the golden color the stitches involved in the transfers, with the addition of 2 all knit rows at the top. Moving stitches on these last 2 rows is optional. The circles on blue represent the needles that are temporarily emptied with each move, then in turn filled as illustrated above. 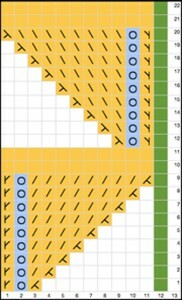 A single row of knitting remains along the ladder edge, keeping the ladder space smoother and free of uneven holes. 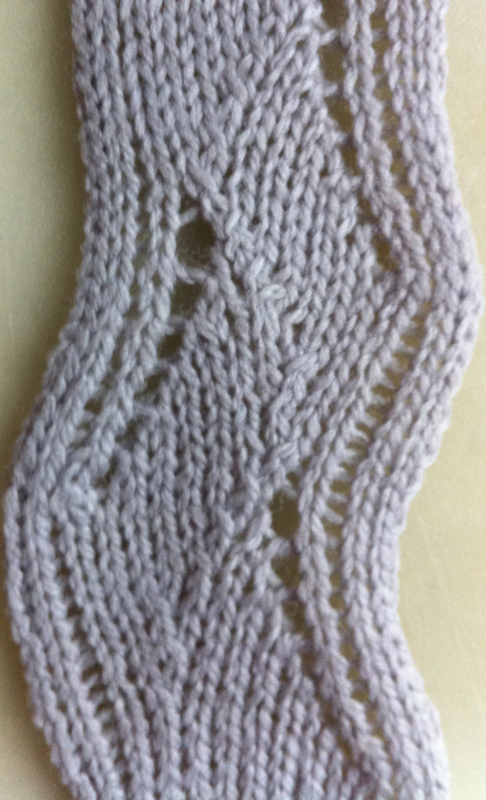 Those lace holes may be kept to create a very different fabric, as seen in the sample below, which includes some operator error. Transfers take place every 2 rows to allow formation of stitches on the emptied needles. Other variations ie. 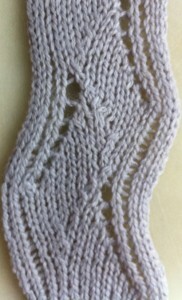 repeating transfers from same side in reverse order atop each repeat, etc., vary the look and slant of the swatch. Understanding how the lace carriage works will help explain why some types of transfers do better in the realm of hand techniques.